Kulturelle und sprachliche Diversität an der Hochschule, Artikel in der Mitschrift. Cross-Teaching, Peer-Learning und Expertisentransfer, Artikel in der ViadrINFO. Schreibend lernen im Team, Artikel in der Union. Integration via Komptenz, Artikel in der Union. Hille, J./ Hiller, G.G./ Vogler-Lipp, S. (2016): Intercultural peer tutoring competences as a part of learning development in an international higher education context. In: Journal of Learning Development in Higher Education. Hiller, G.G./ Deutsches Studentenwerk (Hg.) (2016): A Matter of Perspective - Critical Incidents from the point of view of Studentenwerke and higher education instutions. Hiller, G.G. (2013): Cultures d'enseignement et d'apprentissage en France et en Allemagne dans un contexte universitaire d'internationalisation et de mobilité. Gonnot, A.-C./Rentel, N./Schwerter, S. (Hg. ): Dialogues entre langues et cultures. Reihe: Studien zur Translation und interkulturellen Kommunikation in der Romania, Peter Lang-Verlag, Frankfurt/Main. S. 147 - 176..
Hiller, G.G. (2012): Kompetencja międzykulturowa dla polskiej i niemieckiej młodzieży w regionie przygranicznym. In: Busch, M./Lis, T./Müller, D. (red.) (2012). Uczenie się po tamtej stronie Odry. Regionalne projekty edukacyjnych w regionie przygranicznym - koncepcje i materiały. Podręcznik dla nauczycieli. Garmond Oficyna Wydawnicza, Poznao. S. 43-53. Hiller, G.G. (2012): On the train. In: Berardo, K./Deardorff , D. (eds. ): Building Cultural Competence. Innovative Activities and Models, Stylus publishing: Quicksilver Drive. S. 326-330. Hiller, G.G. (2010): Innovative Methods for Promoting and Assessing Intercultural Competence in Higher Education. In: 2010 Developing and Assessing Intercultural Competence Conference Proceedings. Edited by CERCLL (Center for Educational Resources in Culture, Language and Literacy), University of Arizona, Tucson, USA. 29 p. Online-Dokument. peer-reviewed. Hiller, G.G./ Wozniak, M. (2009): Developing an Intercultural Competence Program at an inter-national cross-border university. In: Journal of Intercultural Education. Volume 20, Issue S1-2 October 2009, S. 113-124. Hiller, G.G. (2009): Identifying Intercultural Problems between German and Polish Students using the Extended Critical Incident Analysis [37 paragraphs]. Forum Qualitative Sozialforschung/Forum: Qualitative Social Research, 10(1), Art. 45, [Online Journal]. Hiller, G.G. (2009): Cultiver le dialogue interculturel à l’université européenne Viadrina de Francfort-sur-l’Oder, en Allemagne. In: Bergan, S./Restoueix, J.-P. (Hg. ): Dialogue interculturel sur les campus universitaires. Enseignement supérieur du Conseil de l'Europe n° 11. Strasbourg: Council of Europe Publishing. S. 105 - 112. Hiller, G.G. (2009): Cultivating intercultural Dialogue at the European University Viadrina Frankfurt (Oder)/Germany. In: Bergan, S./Testoueix, J.-P. (Hg. ): Intercultural dialogue on Campus. Strasbourg: Council of Europe Publishing. S. 105 - 112. Hiller, G.G./ Wozniak, M. (2009): Mastering the Gap between Theory and Practice in Academic Intercultural Training. Theoretical Considerations concerning a Best Practice-Program. In: Berninghausen , J./Gunderson, C. (Hg.). “Lost in Transnation - Towards an Intercultural Dimension on Campus“; Intercultural Studies: Edition 8; ZIM Center for Intercultural Management; University of Applied Sciences Bremen; Kellner-Verlag Bremen. S. 111 - 130. Hiller, G.G. 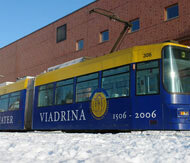 (2008): Communication between Germans and Poles at the European University Viadrina. WU Online Papers in International Business Communication. Series One: Intercultural Communication and Language Learning, Wien. 11 S.
Hiller, G.G. (2008): Komunikacja interkulturowa w polsko-niemieckiej szkole wyższej. In: Bielawska, A./Wojciechowski, K. (Hg. ): Problemy zarzadzania miedzynarodowa wspolpraca szkol wyzszych w regionach przygraniczach, Trans-Uni 12, Berlin 2008. S. 194 - 212.